Summary: A stunning debut novel in the vein of Sarah Waters’ historical fiction and inspired by true events, it tells the fascinating story of a woman who must choose between revenge and mercy when she encounters the doctor who subjected her to dangerous medical experiments in a New York City Jewish orphanage. At this year's BEA, I had the pleasure of meeting author Kim van Alkemade. The folks at William Morrow were very excited about her new novel ORPHAN #8, and they wanted me to meet her. Since I consider authors to be my version of rock-stars, I jumped at the chance. After talking for a few minutes, we realized that we are practically neighbors. We live less than a half hour away. Ms. van Alkemade mentioned her book release party -- which just happens to be tonight; and I can't wait to see her again and tell her how much I adored her book! I picked up ORPHAN #8 with pretty high expectations, and I'm so happy to say that I wasn't disappointed. Rather, I fell in love with this story and the writing. I was surprised to discover while reading the Acknowledgments Section that there were characters in the story based on the author's own grandfather and great-grandmother. I love how well the author blended fact with fiction! ORPHAN #8 tells the story of Rachel Rabinowitz. Rachel is just four years old living with her parents and her older brother Sam when a tragedy occurs leaving both Rachel and Sam, for all intents and purposes, orphans. The children are divided with Rachel going to live in an a Jewish home for infants, while Sam is moved to the larger school for older children. At this orphanage, Rachel is first introduced to Dr. Mildred Solomon, a radiologist who conducts medical research on Rachel and other orphans. The X-ray experiments she conducted had many negative and lasting effects on Rachel which she had to deal with the rest of her life. Fast forward almost 40 years when Rachel is a nurse working at the Old Hebrews Home in Manhattan. She is shocked when Dr. Solomon becomes her patient. Dr. Solomon is in the last stages of cancer and only has a short time to live, and Rachel discovers that everything about her painful past resurfaces. Rachel is determined to make Dr. Solomon admit and repent for her treatment of the orphans; however, Dr. Solomon, drugged on morphine most of the time, isn't quite willing to apologize. As Rachel tries to "make" Dr. Solomon face her past, Rachel discovers many things about her own self in the process and learns that life is far from being just black and white. Wow! ORPHAN #8 packs a very powerful punch and I just loved it. The novel is highly readable, which is a testament to the author, but also very thought-provoking; and I think readers are going to love the complexities of the story and Rachel's character. Needless to say, there are many difficult scenes in this story that made me both disgusted and heartbroken. And I just appreciated all of them because they made me think and feel! I really appreciated how ORPHAN #8 was written. The story is told in both first and third person, alternating chapters between Rachel present and her past. And I probably don't have to tell you that balancing this method of storytelling probably wasn't easy for the author. Yet, the transitions were smooth and the different voices worked extremely well. It's hard for me to decide what I liked more about ORPHAN #8 - the story itself or the characters. Good thing I don't really have to decide! Suffice it to say that readers who enjoy character driven stories and readers who like a good plot will both find many things to appreciate about this novel. I honestly can't stop thinking about Rachel which is always a sign of a good book, but I was also blown away by her story. This little girl went through so much at the orphanages before she was even 16 years old. And then the next few years of her life weren't exactly a walk in the park either. Thank goodness she found some kind people that taught her some valuable lessons during her journey or the book could have been one big cryfest for me. I have to give huge props to Ms. van Alkemade for creating a character in Rachel that I fell in love with. She was far from perfect -- how could she have been?, but she was so amazing complex and real to me. There were times in this novel when she disappointed me, and had it been most characters in books I read, I would have had a hard time getting past it. However, Rachel's mistakes only made my heart break. I felt so bad for her. The story of Rachel's life was also a page-turner. I had a hard time putting this book down, but I also didn't want it to end. I love it when that happens! A lot happens to Rachel in the pages of this book, and the story itself is well-paced. I was just very impressed with how Ms. van Alkemade made everything work in this story. It was very interesting with complex characters, its historical information blended well with the story, and most importantly, it made me feel! What more can I really say but that? ORPHAN #8 would make a perfect book club selection. I say that a lot here at Booking Mama, but this time I'm going to put my money where my mouth is! 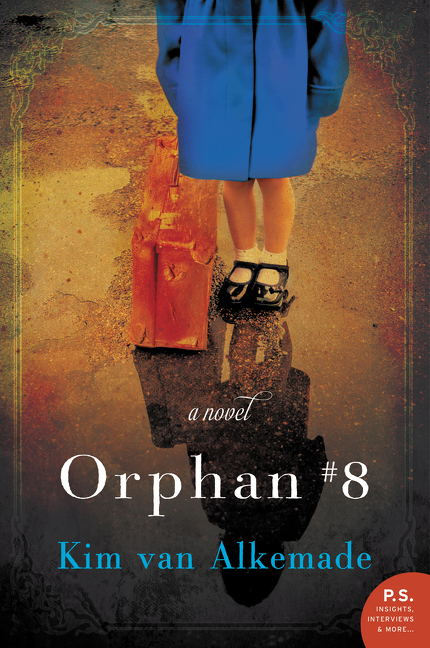 I am selecting ORPHAN #8 for the September book for my group... and I'm hoping Ms. van Alkemade can join us in person to discuss her novel. There is a reading guide available with twelve great questions. Some of the themes you might want to discuss include grief, loss, parenting, abandonment, friendship, betrayal, trust, medical testing, revenge, love, and redemption. Your group will also enjoy discussing Rachel -- she's fascinating. I highly recommend ORPHAN #8 for fans of historical fiction and women's fiction. There are some fascinating characters and some very touching moments which will appeal to many readers. I received a copy of this novel at the 2015 BEA. This one is on my list. I'm so glad you gave it a rave review. That means I'll like it too! I swear you always meet an author from PA at BEA! This book sounds fantastic!! I can't wait to read it. How exciting! And you get to meet her again. Have fun tonight! I've never heard of it before, so thanks for the review. I read an early release of this book and loved it. So happy to see you giving it a great review. Its one of my top 5 favorite books of the year so far. I reviewed this one last week. I gave it one of my rare 5-star reviews!